Choice of vinyl or canvas !!! 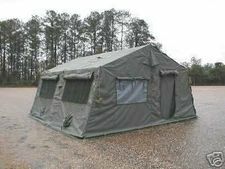 US GI expendable "Squad tent", aluminum frame supported, free standing clear span 100% cotton canvas or modern vinyl, per your choice. Sizes 16'x16', 16'x32', and 16'x48', 16'x64, 16'x80 and 16'x96'. Tents are inspected & serviced prior to shipping, are solid and ready to use. Repairs if needed are made by us using US original materials only. All tents come complete with original (slightly used) frame, a carry cover, guy ropes & rope slips. Add to cart and calculate shipping. Use 'Freight' option on shipping calculator after adding to your cart for shipping rates or call us if you need a personalized shipping quote.